Between two sword club meetings with main focus on the Rai school, I thought I do some research to provide some background on the origins of the school as I am unfortunately unable to provide some Rai blades for appreciation. We known that the Rai school originated in Kyôto, Yamashiro province, somewhere in the mid-Kamakura period, and that in terms of workmanship it is probably linked to the Awataguchi school. These are the facts we have about the school´s origins, now to the theories. Most old relevant sources quote Kuniyoshi (国吉) as founder of the Rai school and the Kanchin´in-bon mei-zukushi (観智院本銘尽) from Ôei 30 (応永, 1423), the oldest extant sword document, states that Kuniyoshi was a Korean smith who had immigrated, or who had came to Japan, and sees the origins of the school´s name in the term raigoku (来国). Raigoku means namely literally “came to [our] country” and so the first character was adopted as name of the school and the second character, koku/goku or in its Japanese reading kuni, was adopted as tôri-ji (通字), as distinctive character used in the names of all people belonging to a single clan or school. So raigoku extended by another character became “Rai Kuni-X”, e.g. “Rai Kuniyoshi” (来国吉). This theory, i.e. that Kuniyoshi was from Korea and had immigrated to Japan where he founded the Rai school, is also found amongst Fukunaga Suiken´s (福永酔剣) seven theories on the Rai school´s character “Rai” forwarded in his publication Nihontô-daihyakka-jiten (日本刀大百科事典). Two more of these seven theories are pretty similar, namely one says that the Rai school´s ancestor – no concrete name is mentioned, just “ancestor” – came from Korea, and one says that Kuniyoshi´s ancestor was from Táng China (唐, 618-907). So these two theories too go with the assumption that the school´s use of the character “Rai” goes back to an earlier immigration. Another, similar theory from the seven says that Kuniyoshi´s supposed son Kuniyuki (国行) was a copper craftsmen from another country (no specification here) who came to Japan, and because his skills were of use for the country, he was granted with the family name “Rai” by the court. This practice was pretty common and we can confirm from historic sources that several Korean immigrants were naturalized by the court and received family names. Another theory of the seven says that “Rai” (来) was an abbreviation of the Korean family name “Rae.” This name is written with the left-hand radical (阝) and the old variant of “Rai” (來), but as this character is not available in modern charset, I have to quote it as (阝來). Reading of this theory, I immediately remembered a tantô which had been a confusing jigsaw piece in explaining the origins of the Rai school for now half a century. The tantô in question (see picture 1) was once owned by Mr. Asabuki (朝吹). It is dated “Bunji ninen nigatsu ?-nichi” (文治二年二月？日, “? day of second month Bunji two ”) and its signature is mostly quoted as “Rai Sama no Jô Minamoto Kuniyori” (徠左馬尉源国頼). Already Dr. Honma writes in his Nihon-kotô-shi that it is possible that the Rai connection of this tantô goes back to an erroneous transcription of the character “Chin/Jin” (陳). So according to Honma, “Chin/Jin” (陳) became “Rai” (徠). But with Fukunaga´s forwarding of the theory with the Korean family name “Rae” in mind, maybe the tantô is not signed with “Chin/Jin” but with “Rae” (阝來)? So the chronicler was just wrong with the left radical, i.e. 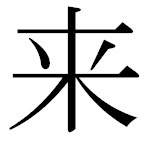 (彳) compared to (阝), instead of getting the entire character wrong, i.e. (徠) compared to (陳). The problem is that the first character of the signature is hardly legible. But who was this Kuniyori? His name does not appear in the old sword documents and it seems that he slipped into the meikan just towards the beginning of the Edo period. The Kokon-mei-zukushi (古今名尽) quotes him as ancestor of the Awataguchi school but says that he was not a swordsmith and that he lived in Yamato province. He is followed in the genealogy in question by his son Kuniie (国家) who in turn is listed with the comment “he was the first who carried out the profession of a swordsmith” and that he was a descendant from Yamato´s Kôfukuji (興福寺), although it doesn´t say in which context this “descent” has to be understood. Anyway, the aforementioned tantô shows typical Awataguchi characteristics, i.e. a nashiji-hada, beautiful ji-nie, a nie-loaden chû-suguha, and an ô-maru-bôshi. And because of this typical Awataguchi deki, the inscription was brushed aside as not showing the characteri “Rai” (徠) but “Chin/Jin” (陳). But with the Korean family name “Rae” (阝來) as a possibility, we might come back to a direct Awataguchi-Rai connection. However, Kuniyoshi and his son Kuniyuki (国行), who are today considered as actual founders of the Rai school, were active about 70 or 80 years later than this tantô was made. Honma also mentions another Kuniyori tantô dated Gennin one (元仁, 1224) but he is doubtful of the authenticity of the signature. I haven´t seen any oshigata or pictures of this tantô yet and he also doesn´t go into detail regarding its workmanship. Incidentally, the Kokon-mei-zukushi says in another context that the Awataguchi-ancestor Kuniyori was active around Kôji (康治, 1142-1144). So all these speculations might lead – with a little phantasy – to a new theory, namely that maybe both the Awataguchi and the Rai school had their origins in Korea or in a smith whose ancestors had immigrated from Korea? Let us now turn to the fifth theory on how the Rai school came to the character “Rai.” This theory, which goes according to Fukunaga back to the Honchô-kaji-bikô (本朝鍛冶考, 1796) and Kokon-kaji-bikô (古今鍛冶備考, 1830), sees the etymological origins of “Rai” in context with the swordsmiths school in the Yamato period. At the time of the Yamato state, people were basically divided into three social groups, the uji (氏, clans or kin groups), be (部, occupational groups), and yatsuko (奴, servants or slaves). That means each be group was responsible for a specialized task and named that way and this name turned later into a clan, and even later into a real family name. And the theory now quotes the be group of the Kumebe (来目部・久米部) as possible origin of the character “Rai.” The Kumebe were professional warriors under the command of the powerful Ôtomo (大伴) and when it was later “time” to use the be name or parts of the be name as family name, “Kumebe” (来目部) was abbreviated to “Ku” (来), i.e. “Rai.” For example the clan name “Ôtomo” was later abbreviated to “Tomo” (伴) and so on. And as the Kumebe were professional warriors, it is safe to assume that they had certain swordsmiths working for them, and so the theory is not too far-fetched. However, we are speaking of Yamato and maybe Nara times, so a lot of time passed until the emergence of the Rai school of swordsmiths. And the seventh and last theory has nothing to do with any immigration and also does not base on etymological assumptions. It says that when Rai Kunitoshi (来国俊), Kuniyuki´s supposed son and Kuniyoshi´s supposed grandson, climbed Mt. Hiei (比叡山) northeast of Kyôto and looked down on Lake Biwa, the sailing ships heading towards him reminded him one day of the character “Rai” and this was when he decided to sign with this character. This theory matches at least with the extant works because no blade predating Kunitoshi is signed with the prefix “Rai.” Also true is that the character for “Rai” really looks like a sailing ship in front view with its bow and fully blown sail (see picture below). But Kunitoshi was and is not the only one noticing this similarity and so this theory is probably nothing more than a nice anecdote. And since we are on the subject, I want to introduce a blade of a meikan-more Rai smith, i.e. of a Rai smith whois not found in the meikan records, namely of Rai Kunikiyo (来国清). It is dated Meitoku four (明徳, 1393) and dates thus to the very end of the Nanbokuchô period. One year later the Ôei era (応永, 1394-1428) started, what means in historic terms Muromachi period. So this is probably one of the latest dated Rai works known and comes from a time when the school gave up its predominance and left the field to its offshoots like Ryôkai, Nobukuni, Enju, or Chiyozuru. Nothing to do with the main topic I know but I thought he blade is nevertheless of interest.